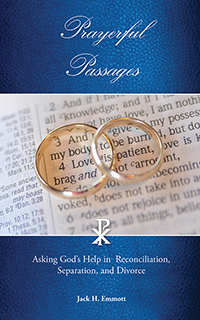 In Prayerful Passages: Asking God's Help in Reconciliation, Separation, and Divorce, Jack Emmott, with profound clarity, helps faithful people struggling in their marriage to find not only the words they need to pray, but also the Divine Presence and power they need in challenging life circumstances. Jack H. Emmott is a life-long Christian who learned to pray as a small child at his mother’s side each night before bedtime. At age six, Jack was struck with polio. Despite his devastating paralysis and decades of surgeries, Jack never gave up praying and he never gave up on God. 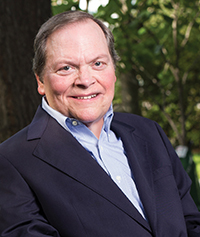 In fact, God’s gracious answers to Jack’s many prayers have been, in part, a fulfilling career as a family law attorney, a beautiful and loving wife, children and grandchildren. In Prayerful Passages, Jack has opened the doors of comfort and healing to guide a Christian struggling with the anger, loss, and grief that inevitably arise during the separation, divorce, and reconciliation stages of a marriage in peril. Open the doors of your own heart to God’s grace and healing. These prayers will aid you in your journey.